I married my husband in December 2003. I was in a bit of an existential funk at that time. I had just returned home from a year-long work assignment in Cairo, exhausted and drained. Work wasn’t fun or fulfilling any more. I yearned for meaning, a sense of purpose. But I lacked clarity and confidence, and marriage felt like a good move. I thought I could just stay in there and marinate in all the complex emotions I was experiencing, hoping they’d sort themselves out eventually. I never liked “wife” or “daughter-in-law” much. But then I didn’t like “girlfriend” either, and I had happily inhabited that space for a good five years before marriage was proposed. I think I have a basic issue with labels, period. I do love “daughter,” “sister,” “cousin” and “friend,” though. I know, I know… all these are labels. Some feel natural, fit closer to the skin, and are harder to peel off. Some others I reluctantly pinned on, and they dangled awkwardly off my bony shoulders like ill-fitting necklines. “Wife” and “daughter-in-law” felt very burdensome. I didn’t feel up to the work involved, or the hidden expectations. But I figured, I was going to marry my best friend, and together we could make “wife” and “husband” work. I enlisted the help of a little diamond in this effort. A few weeks before the wedding, I went to a local jeweler and got my nose pierced. I was marrying into a Gujarati family, and many Gujarati women have their left nostrils pierced. It felt like a good fit, and I felt like a good fit. My mother-in-law was delighted too. She gifted me one of her own diamond nose pins, and it sparkled on my young bride face. Off I went and got married, and flew to the United States. I had thought that the tiny stone would cement my relationship as “wife” and “daughter-in-law,” that it would help me inhabit these roles in a more fluent and comfortable way. But it didn’t work out that way. Here in the United States, the nose pin felt like an appendage. It looked and felt loud, fake. Neither was it going to help me find my niche as a married woman. I’d have to figure that out on my own. And I was progressing nicely on that front. My husband and I were discovering what it meant to be married, to be living together. In our particular dynamic, he was no husband and I was no wife. He was P, and I was A. “Husband” and “wife” felt artificial, and we were reluctant to use those terms with reference to each other. I tried to be “wife” and “daughter-in-law” but “girl” was whom I felt like. She resurfaced quickly enough and pushed all other ideas and identities away. Long story short, the diamond nose pin came off. Two years passed. I was introduced to yoga and meditation, thanks to an introductory workshop I attended locally. These practices gave me a new lease on life. I felt myself energized, inside and out. I started helping with organizing similar workshops. I dreamed I’d become a meditation instructor, someday. Come 2006, and we headed to India to attend an international cultural event celebrating yoga and its many benefits. We landed in Bengaluru, and I got a glimpse of the yoga-meditation community in India. I saw young women, so beautiful and hip, dressed in sparkling saris and silver jewelry. I saw older women resplendent in elegant silks, diamonds and bindis aglitter. I saw jasmine flowers woven into long hair, top knots with jeweled hair ornaments, halter necks and crop tops masquerading as sari blouses, skinny jeans and colorful embroidered kurti tops, toe rings, et al. I was entranced. I had forgotten how hip and attractive Indian style could be, especially when it incorporated Western elements. Cotton handloom sari with a crop top and a navel piercing? Skinny jeans with a traditional Bagh print top and a nose piercing? I wanted it all. I wanted to be that Indian girl/woman who freely expressed her Indian self in the United States, but in a way that felt contemporary, relevant. I wanted to be “mod,” as we called it in Mumbai. I wanted to be equal parts Indian beauty and young Atlanta native. I wanted the sooty kajal and vibrant kurtis, silver jewelry and silk sarees, but I also wanted the skinny jeans and boots and trench coats. I wanted to be able to switch flawlessly between Hindi and Malayalam and English, to enunciate very clearly the difference between “v” and “w,” to achieve a softness to my vowels and consonants. I wanted to be the person who switched identities seamlessly, flawlessly. I wanted to be beautiful in a way that was unmistakably Indian, yet universal and modern. And I thought a diamond nose pin could help me achieve that. Back I went to the same jeweler. He showed no sign of recognition, asked me no questions. I returned to the United States, shiny bauble glittering in my left nostril yet again. Maybe I was less Indian than I thought. The diamond nose pin came off a few weeks later. What remained was a tiny mark on my left nostril, proof that I’d tried to fit in. And so on it continued for many years. Periodically, I’d experience a mild sense of relief that I had removed the nose pin. I didn’t want to come across as “too” Indian. I wanted to keep my ethnicity indeterminate, as much as I could. I didn’t want to be typecast as Indian, South Asian, whatever. Ten years passed. One day, I noticed a young Indian woman at my workplace, sporting a gold nose pin in her right nostril. It looked perfect; she looked beautiful. I was smitten. I had to get it done myself. I hastened to an Indian salon, got pierced again… the right nostril this time. It was a large, fake diamond, and it was perfect. I loved it, and I loved how I looked in it. So I got myself a genuine (albeit tiny) diamond nose pin. It glows like a little flame, catching the light as I move, sparkling in low light and dark places. I wear it all the time, only taking it off when I am getting a facial massage. Needless to say, I have zero reservations or mixed feelings about it. I intend to keep it on. What’s different this time? Does it matter that it’s on the right side of my face? Perhaps that is a nicer profile for me? Perhaps I simply like this look more. Or maybe what it is is that I am not trying to fit in anywhere. I just want to look pretty, and that seems like a reasonable aim for a diamond to fulfill. I like the tiny invisibility of this diamond. It feels more girl, less woman. It feels naive, hopeful in the best way possible. It makes me think I can write my own roles, play them the way I think fit, discard at will, and move on. I wonder: What if I had gone with the left nostril again? Would it have mattered? 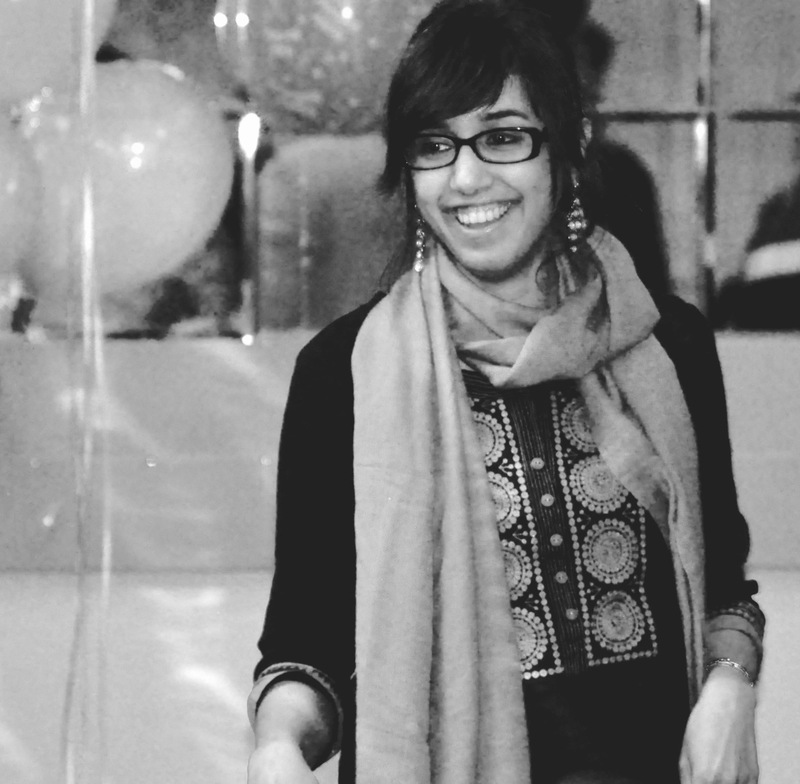 Lakshmi Jagad is a freelance writer, editor, and blogger based in Atlanta. She has a Master’s in Mass Communication from Georgia State University. An ideal day for Lakshmi includes a hike, meditation, writing, and a steaming cup of masala chai. She is a vegan food enthusiast, lover of slow travel, and counts dates+almond butter as dessert. She blogs at The Rich Vegetarian.